Pop. 338. In the Reg. Mun. of Ottawa-Carleton on C. Rds. 28 & 35, 23 km. E of Ottawa. Pop. 759. In Reg. Mun. of Ottawa-Carleton, on C. Rd. 28, 24 km E of Ottawa. The post office was established as Navan in 1861, named after a town 10 County Meath, Ireland. All the fun you'd expect from a great country fair! 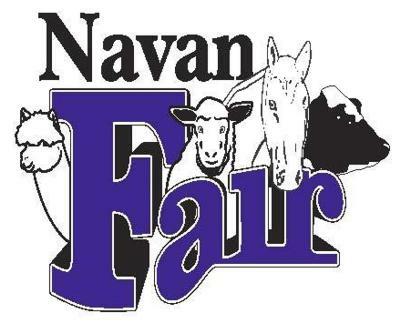 Come see horse and livestock shows, agricultural exhibits, antique tractor display, midway, demolition derby, live entertainment all weekend long and much more! Pop. 265. In Gloucester and Cumberland Ts., Carleton and Russell Cs., on C. Rd. 28, 15 km. E of Ottawa. Pop. 479. In Rideau T., Reg. Mun. of Ottawa-Carleton, on the Ottawa R., and C. Rds. 34, 35 & 174, linked by ferry to Masson, QC, 26 km. NE of Ottawa. Pop. 353. In Severn T., Simcoe C., on the W shore of Lake Couchiching and Hwy II, 11 km. N of Orillia. In Orillia T, Simcoe C., 2 km NW of HWY. 11, 16 km NE of Orillia. Name approved by CBGN in 1951. Pop. 338. In Clarence T., Prescott and Russell Cs., on C. Rd. 21, 35 km E of Ottawa. Pop. 8,070. In Clarence T., Prescott and Russell Cs., on the Ottawa R. and C. Rds. 21 & 174, 32 km NE of Ottawa. Pop. 442. In Clarence T., Prescott and Russell Cs., on C. Rd. 8, 41 km. NE of Ottawa. Pop. 206. In Clarence T., Prescott & Russell C., on C. Rd. 1, 36 km NE of Ottawa. In 1886 the post office was established as The Lake. Pop. 43. In Reg. of Ottawa-Carleton on C. Rd. 8,21 km SE of Ottawa. It is believed William Cameron Edwards (1844-1921) is the man honoured by this place name given in 1901. Pop. 17,226. In Reg. Mun. of Ottawa-Carleton, on the Ottawa R. and C. Rd. 34, 14 km. NE of Ottawa. The first settler was Joseph Viseneau. Pop. 970. 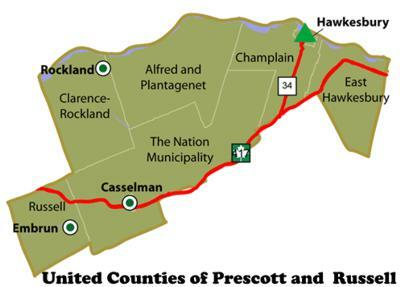 In Clarence T., Prescott and Russell Cs., on Bear Brook, a tributary of the South Nation R. at C. Rds. 2 & 8, 41 km. E of Ottawa. In South Plantagenet T., Prescott c., on the South Nation R., and C. Rd. 8, 89 km E of Ottawa. Pop. 77. In the United Cs. of Prescott & Russell on C. Rd. 19, 47 km. E of Ottawa.